I've already posted this piece in my PJ gallery, and DA.. so I'm probably not gonna make any serious edits, but I'm hoping to learn..
How can I define forms of the dragon and where ever else it lacks form, and how could I have avoided pillow shading ? What exactly do you guys think I need to improve on ? Your work appears flat because everything seems to be lit from the front, there is no clear light source in the piece. Lightning is the tool we use to show forms and sculpt shapes with, when your piece appears uniformly lit everything looks like it's one the same plane. I quickly doodled over your piece. I assumed the Dragon would be lit from above so I started blocking out different lightning planes. See how this makes the shapes more believable and readable. Try to pick a clear light source and think about how the forms in your picture would react to it. Sure, that light source could be frontal but that doesn't mean that ''pillow lightning'' is the answer. Also the way the texture of the dragon doesn't change direction with the forms is also something that flattens it. Something I didn't touch on in my edit is that the tail seems to be on a different plane than the ground, not resting on it. Partly because it seems to follow another perspective and because of the heavy outlining. Also the lack of shadows ( other than the ladder ) also contributes to the flatness of it. I did a smaller edit of the knight where I lit him from the front and added just a small shadow. Lightning is a wonderful tool to make your image seem more alive. Also on a different note the ''wing horn'' on the dragon blends into the background a lot. I'd consider changing the color of it. Finally i just have to say that it is already a very pretty picture and I'm glad that you want to take it even further! I wish I had your productivity! Thanks a lot for taking your time to make such a useful post for me ! Since if Princess is facing light source, shouldn't the light source be hitting Knights back and I should have shaded the front instead ? The pillow shading is the real problem of your piece. Despite a charming scene, beautiful & subtle pixel patterns, the volumes are hard to understand. For instance, I can't really understand how the princess stands on the bush. It seems round & fluffy, not like a platform you can stand on. I painted a messy edit myself to show you what I mean. I lost all your beautiful swirls patterns in the process because I don't have the time to paint them myself, just focus on the overall feeling, and keep in mind it's a fast draft, it's not as precise & polished as your work of course. 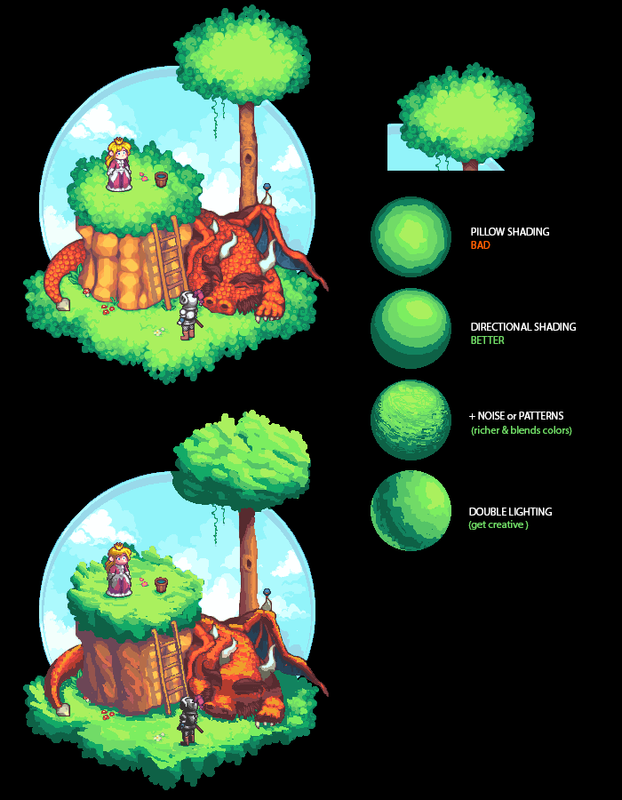 Hopefully it should helps a few people, because pillow shading is a really common issue unfortunately ! I really like how you improved the piece..
but I'm wondering, how could I make some improvements without changing the angle of light source ? my light source was meant to come from bottom of the picture, which is why I made the grass/tree lighter at the bottom and darker at the top.. I would have actually probably made the piece more alike your edit, if I was working on it as a game mockup, since I know walls in iso games on one side should be darker than the other.. But since I was working on it as a picture and not game graphics, I really never thought of it. Unfortunately I'm nowhere close to being good enough to offer useful advice, but I just want to say that I think you had a good style going. Some lighting and shaping could be improved I'm sure, and the edits done by tim make it more realistic, but I think at the cost of some of the charm the piece evoked from the beginning. the edits done by tim make it more realistic, but I think at the cost of some of the charm the piece evoked from the beginning. I doesn't have anything to do with the lighting. I don't have the time to make all the cute little swirls & pixel patterns of the original image. That's why I lost a lot of the original charm & style in the process, and all the interesting textures like the dragon scales. It's a rough edit for lighting & shading purposes only, not pixel patterns, so you should focus of the overall impression and not details. Wether we're talking photography, painting, video, or even eye vision, remember that it's always perception of light. Therefore lighting is absolutely crucial in any visual piece, game graphics or not.